After meeting rigorous inspection requirements, Minibus World are proud to announce our product has met both Peugeot UK and Head Office technical requirements and we are now a manufacturer of Peugeot Approved Minibuses. Designed and custom built to seat 17 people and up to 6 wheelchairs. The CanDrive EasyOn 17 Seater is IVA tested and may be driven on a standard B driving licence, meaning no expensive and time consuming D1 licence training required (conditions apply). New vehicles can be first registered as a minibus for schools and charities. The Peugeot base vehicle is provided with a 3 year Peugeot contractual warranty and the conversion with a 3 year Minibus World warranty. The base Peugeot vehicle features a 2.0 BlueHDi Euro 6 diesel engine and 6 speed manual transmission, meaning excellent performance combined with impressive fuel economy and low emissions. Heated electric wing mirrors with 4-way adjustment, electric windows, Bluetooth connectivity, DAB radio, remote central locking, height adjustable drivers seat and steering wheel are standard equipment. We also ensure our CanDrive Minibus range are fitted with heated rear windows as an upgrade completely FREE OF CHARGE. All making this a comfortable, safe and pleasing vehicle to drive. Featuring fully removable rear saloon seating and under floor wheelchair lift. Rear saloon passenger travel is provided with M2 tested and certified seating, all seats fitted with a headrest and an all age adjustable 3-point seat belt. It is insulated, carpet lined and fitted with courtesy lighting throughout. The rear saloon floor is overlaid with a non-slip covering. Able bodied passengers are afforded the same safe and efficient ease of boarding with the side door entrance being complemented with a side step and full height handrail. Options to upgrade to twin handrails, or all age fold out handrails or automatic electric side step are available. Fully glazed rear saloon with 2 vented, slide opening windows. All rear windows are fitted with kite marked safety glass as standard fitment at no additional cost. We recognise the importance of individuality. A well designed and thought out Minibus can be an excellent marketing tool for your company / establishment with the addition of sign writing or livery, but the opportunity to specify coloured seating, piping and seat belts perhaps replicating colours within your logo or crest means that your passengers / pupils instantly know its their bus. 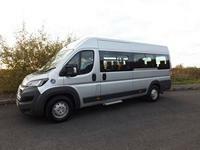 Please see a few of the sample photographs of minibuses recently supplied indicating some of the options available. To upgrade from the standard base model to a professional model costs £500. Inclusive of integrated touch screen sat nav, c/d player USB input, DAB radio, cruise control and air conditioning. A highly professional, yet personal approach is taken by us at Minibus World so please feel free to call us for a quick chat about your requirements. Purchase this Minibus from £33,995 + VAT or lease from as little as £14 + VAT per day over 5 years. Still wondering whether to buy or lease a new minibus? Our unique Try Before You Buy and Try Before You Lease deals let your establishment experience a minibus for up to 6 months, with no long-term commitment or obligation. For an affordable £14 + VAT per day we will match you with an ideal minibus so you can see how much convenience it offers, saving you countless hours spent organising transport and potentially reducing your costs.